Have you ever stumbled upon a scam website presenting a secret slot strategy which will make you a lot of money? Don’t expect anything like that in this article. Slots can’t be defeated in the long run. Although slots are theoretically unbeatable, there were some cases of players able to legally or illegally take advantage of their weaknesses and make money. You can read more about them in my article How to beat slots. Every player looks for something else, so there is no ideal strategy that fits everyone. I will show you my strategies, each suitable for a different kind of players. Finding out which of them fits you best is up to you. You’ll more likely understand how my strategies work when you have already understood the concepts of slots RTP and variance. 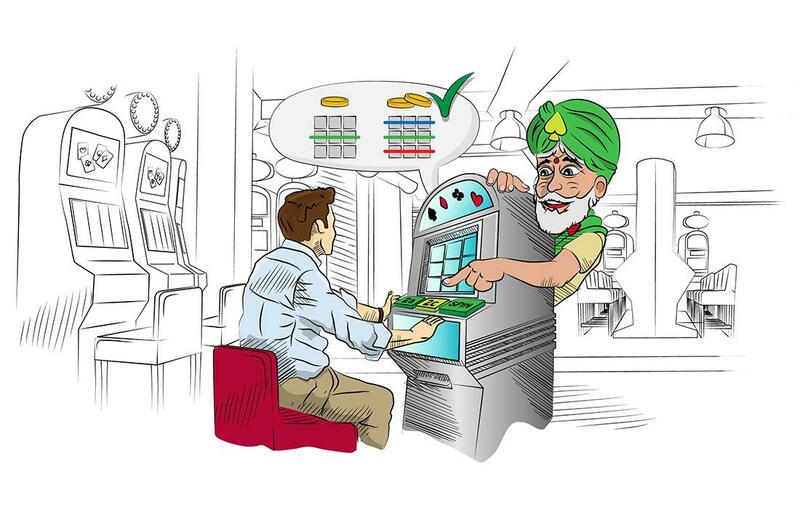 At first glance it seems online slot machines are a 100% game of chance. And they really are, at least in the terms of a single game round. However, that doesn’t mean that you can’t influence your chances by using the right betting strategy and choosing the right game to play. In the rest of this article I’ll teach you how to use the choices above to play slots more effectively. While slot RTP and volatility apply to a single game round, the RTP and volatility of betting strategy apply to the whole game session or casino visit. The following article describes in detail what I mean by a betting strategy. All casino games, including slots, are disadvantageous for a player. Their RTP is lower than 100 % and they favor the casino. That means that you need luck to win, which is exactly why higher volatility is generally better for you. Let me explain… In low-volatility games, the results over time tend to stay closer to the expected return, which is lower than 100 %. On the contrary, in high-volatility games, you are still losing money in the long run, however, you have a chance to win a big sum of money, thanks to the high volatility. That’s why the majority of my slot tricks and strategies are based on increasing volatility, while also considering the game’s RTP. The majority of online slots have the same RTP for all kinds of bets. However, some slots derived from land-based slot games add significant disadvantage to certain bets. In this case you should always choose the bet type without the disadvantage. I will use two examples to demonstrate this fact. Bet on all 3 winlines costs 2 cents and bet on 1 winline costs 1 cent. It’s quite obvious that bet on 1 line has a huge disadvantage and its RTP will be extremely low. Therefore, it is always beneficial to choose the bet of 2 cents. Example 2: Full bets unlock bonus features that double your win on three joker symbols. The game without this feature probably won’t have very attractive RTP. So either choose another slot or play the full bet with highest RTP. The double up feature (red/black) gives you the option to double your win with a 50% chance. In some games (like slots from Novomatic) you can do this multiple times in a row (13 I think). This feature dramatically increases the volatility of the game. From a long-term perspective, you exchange a lot of smaller wins for proportionally fewer wins of higher value. For example, without using the double up feature, you could win 40 times, winning $1 each time. However, if you used the double up feature up to 3 times, you could win 5 times, winning $8 each time. The long-term expected value is the same, but the individual wins are bigger. If your goal is to win big, then double up feature is exactly what you need. It’s predictable and easy to simulate, I use it in some of my recommended slot strategies. Note: Be careful about using the double up feature when playing with bonus money, as it might be forbidden by the bonus terms and conditions. This applies also when playing with free spins no deposit bonuses, where your choice is also limited by the game for which you've received the free spins. Did you know that if you set the game to 1 winline instead of 10, you’ll most likely get 5 to 10 times higher game volatility? When you bet $2 on one line, your average win will be much higher (and less frequent) as when you bet $0.20 on 10 lines. When you bet on 10 lines at the same time, the wins in the paytable are 10 times smaller. In most slots you usually hit a winning combination only on a small number of the 10 lines, so your average wins are also lower. Note that this trick usually can’t be used by high rollers, as the maximum bet per line is usually restricted. But there are also slots which are an exception – like Cleopatra from IGT. However, if you are a player who doesn’t bet more than $2 in a single round, this trick is a must-have. The simple answer to this question is – you have to risk big to win big. However, if you want to win big with highest possible odds, you have to push the volatility of your strategy up to the sky. Controversially, the most effective way to WIN BIG is to try to lose as fast as possible. That doesn’t make sense, does it? Let me explain. Statistically (in the long run), you lose money with every bet you place. That is how the RTP works. To lose less in the long run, you have to minimize the total sum of your bets. 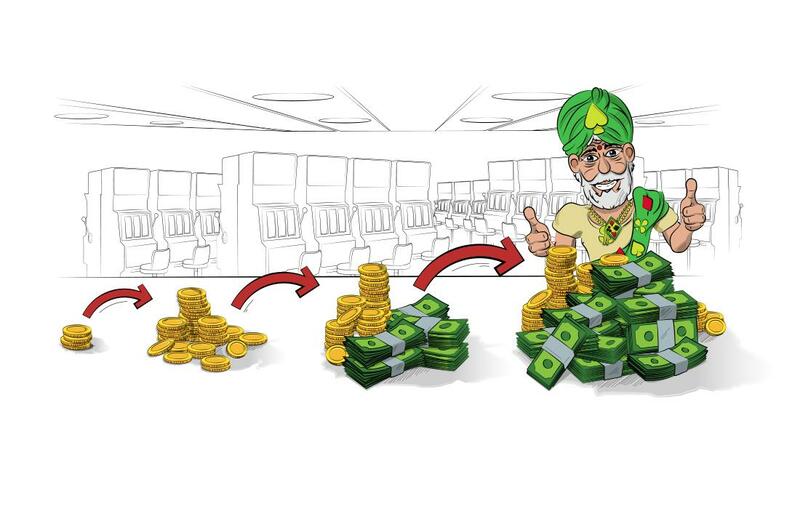 To minimize the total sum of your bets, you have to try to lose your budget with as little betting as possible. If you do so and RTP remains the same, the principles of statistics reward you with a better chance for a big win. Now for my favorite part of the Casino.guru website. Slot math is really my passion and some of the strategies below were invented by me independently from strategies published on other websites. I tested each of them with my own simulation software using reverse-engineered slot games. Any sharing is appreciated :). Smart Gambler is my favorite slot betting strategy. I derived the name from the "gamble button" that gives you chance to double your win with a 50 % chance. You spin with very small bets. When you hit a winning combination, you start doubling up the win using the gamble button. You keep doubling up until you either miss and lose, or until you win that high amount that you can happily withdraw and leave. The Smart Gambler strategy is almost ideal. It has very high RTP, while it also allows you to choose the size of win and how long you will be able to play with your budget. Choose a slot which has a gamble feature. Decide how long you would like to play. Divide this time by the average game round time and you’ll get the approximate number of game rounds. You want to play for 1 hour = 60 x 60 = 3600 seconds. 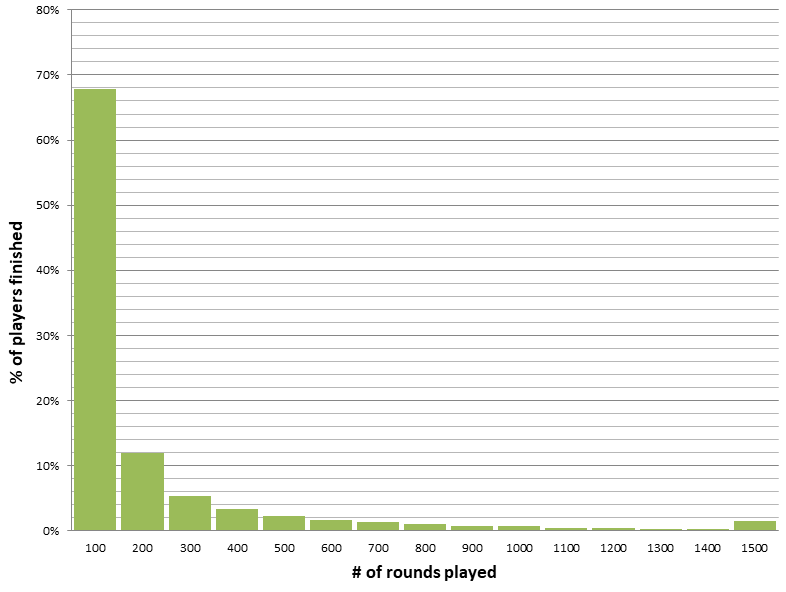 If one round takes around 4 seconds, then you actually want to play 3600 / 4 = 900 game rounds. Check your budget and divide it by the number of rounds you calculated in the previous step. If your budget is $100, then $100 / 900 = $0.11. Your starting bet for each round will be $0.10. Decide the sum of money you want to win. Remember this number or write it down. Start spinning with the calculated starting bet ($0.10 in this case). You win enough. Cash out, leave and celebrate. The game doesn’t allow you to double up anymore. Take the whole win and place it as a bet on roulette. Choose a type of bet that secures you the desired sum of money if you win. Take the whole win and play one spin with a big bet. If you win, go back the point 6 (double up until satisfied). 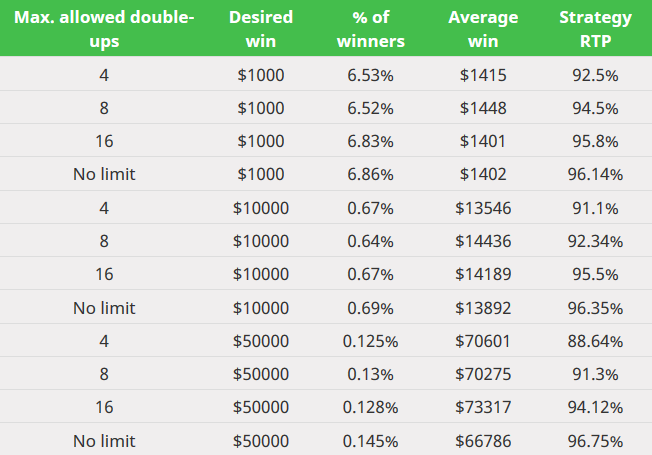 If your selected game has restricted maximal number of double-ups, then I recommend you increase the game’s volatility by configuring just one winline (with the same total bet). With this strategy, you will avoid the low initial wins that you can’t double up to your desired win. If your budget is very low, you can even play on one winline for 1 cent. 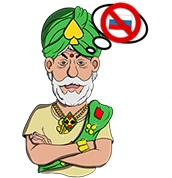 With my Smart Gambler strategy and an adequate amount of luck, you can still win big. 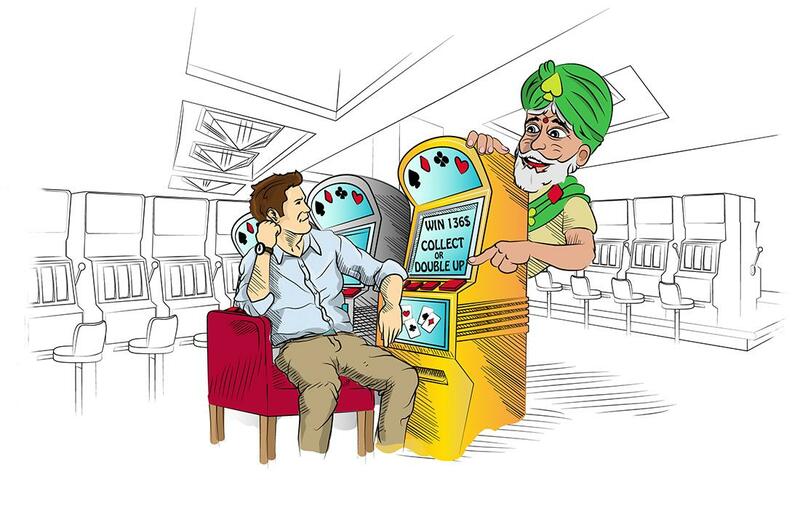 Playing slots is not a race. You can play faster with a lower initial bet or enjoy one spin a little longer with higher initial bets. It’s up to you. Now you probably wonder, how this strategy is doing in terms of betting system RTP. "The RTP of my Smart Gambler betting system is (in an ideal scenario) equal to RTP of the selected slot game." Note that this betting system still doesn’t guarantee you will win, but gives you a fair chance. 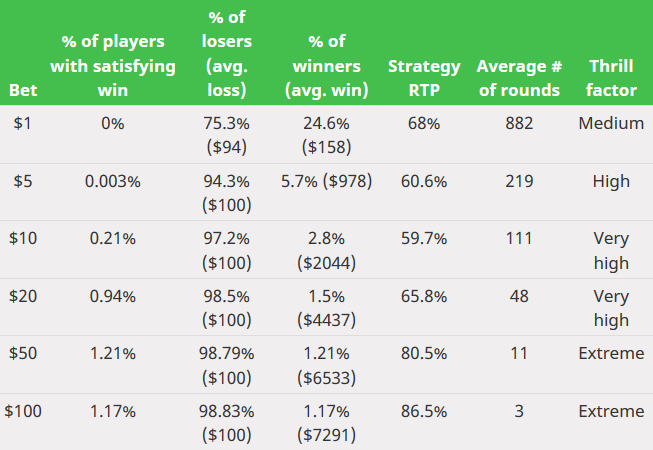 The following tables show the results of a million player simulations using my Smart Gambler strategy. The simulation was completed on a slot with 96 % RTP. The variables were the desired win and the maximum number of allowed double ups. If the win was lower than expected, then the whole win was placed on roulette. A budget of $100 with a $0.10 initial bet gives you 1000 rounds – around 60 to 90 minutes of playing. Simulations prove that RTP of this betting strategy is very high. RTP increases with higher number of allowed double ups, as no additional roulette bets are required. For unlimited number of double-ups, the RTP is equal to the game’s RTP (small differences in measured RTP occur due to extreme volatility in this strategy). Simulations show the Smart Gambler strategy keeps fair chances even when aiming for a giant win (500x the entire budget). However, the chances of such a big win are proportionally low. Be very careful and don’t fall in to the "I’ll once win my money back" loop. A healthy target is something around 5x-20x your daily budget. For all the reasons mentioned I consider this to be THE BEST SLOTS STRATEGY (apart from not playing at all). This is the craziest and the most volatile strategy I could figure out amongst all casino games. It’s similar to betting "All in" on a number in roulette… just MORE volatile. Some slots made by IGT allow you to make a huge bet on a single winline. If you first decrease the number of winlines to one, then the game allows you to increase the bet on that line up to the total maximum allowed bet. In some slots this can be up to $100. With a $100 bet on a single line at Diamond Queen slot, your potential wins range from $500 to $100k. As a result, you either lose everything in just a few spins or win an amount in the range from nice to legendary. You remember, right? 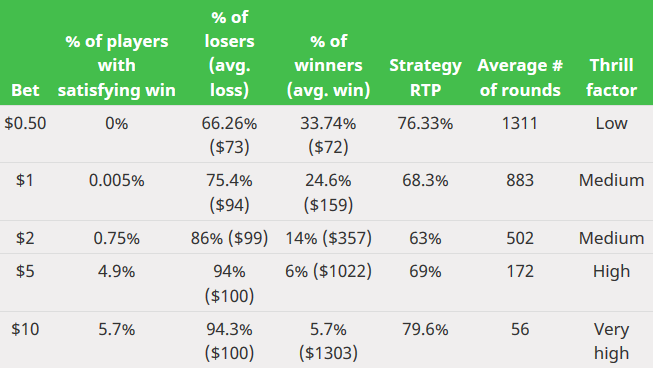 The less you bet in total, the higher is the RTP of your betting strategy. That’s how this strategy works. If you go all in and leave with a win, then the RTP of your betting strategy equals to the RTP of the game. In the case of Diamond Queen, it’s (according to the game’s paytable) between 92.97% and 96.08%. In case of Cleopatra, it’s around 95%. So your one-spin "session" would statistically cost you only $5-$7 (in the long run). The rest would be eventually paid out to winners who use the same strategy. 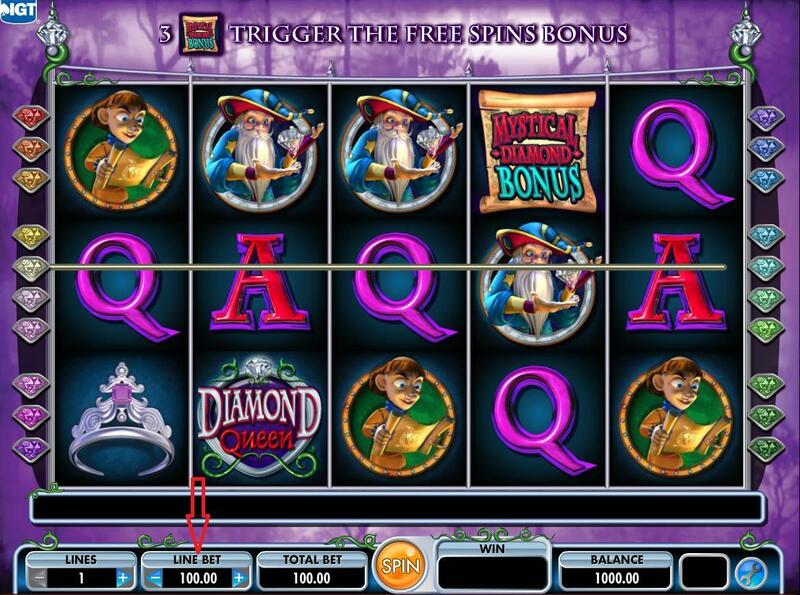 I have found three slots which support this feature: Diamond Queen, Wolf Run and Cleopatra. Cleopatra offers the highest possible win – 10 000 times the bet. However, I would choose Diamond Queen, as it seems more balanced. IGT slots cap the maximum win to $250k. So, if you bet $100 on single line in Cleopatra, you risk that you’ll win $1 million, but only get $250k. Don’t risk a high win in a casino which can’t afford to pay it out. Use this strategy only in huge casinos with monthly revenues over $1 million like LeoVegas. Never exceed your initial budget. Spin and leave when you’ve reached your budget. Don’t use this strategy if you’ve had any sort of gambling problems in the past. If you were crazy enough to try this strategy and then managed to hit it big, please let me know. I’ll share your story. P.S. : I plan to reverse engineer Diamond Queen and calculate the chances for different win sizes. Reverse Martingale is a good betting strategy if your favorite slot doesn’t have a double-up feature. 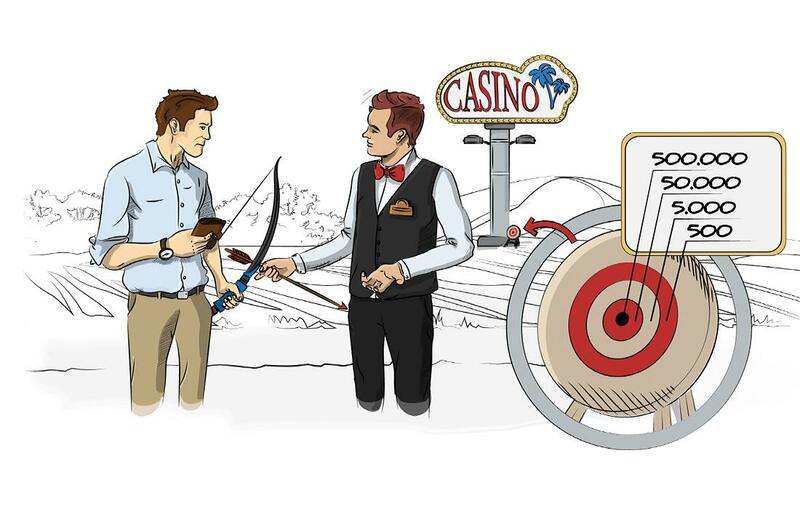 Do you know the roulette betting strategy called Martingale? Reverse Martingale does the opposite. Martingale betting strategy (actually doesn’t work) suggests you to double up your bet after each loss. The idea is that once you have to win and then you’ll win back all your former bets. In reality, your bets grow exponentially and you risk your whole available bankroll in order to win just the initial bet. If you keep using the Martingale strategy, you’ll go bankrupt eventually. The main idea of Reverse Martingale is to play for small initial bets and bet the entire win in the next round until you win big enough. This strategy is similar to the Smart Gambler strategy, but it uses increased bets instead of the double up feature. You start with $100 and bet an initial bet of $0.10. After 15 rounds lost, you suddenly win $4.41. The next round you bet the closest possible amount to your win – in this case $4.40. If you lose, then you continue with the initial bet. If you win again – for example $35, then continue with a $35 spin. If you lose, you get back to betting $0.10 each round. Repeat this until you win a satisfying amount or lose your entire budget. If your win exceeds the maximum bet in the slot which you are currently playing, start placing the maximum bets. Be careful to not spend more than you have won in the previous round. Otherwise you’ll lose big part of your budget and significantly shorten your time of play. The Reverse Martingale has slightly lower volatility and lower overall RTP than Smart Gambler, but its advantage is that you can use any slot that you like, even if it doesn’t have the gamble feature. You can use any slot you like with the Reverse Martingale strategy, unlike with the two aforementioned strategies. Also, the time of play is predictable and you can easily estimate it from the initial bet and your budget. The win amount is less predictable than with the Smart Gambler strategy, but more predictable than the Casual Player strategy or the Moonshot strategy. Reverse martingale strategy doesn’t work that well for high rollers, as they’ll hit the maximum bet of a slot quite often. When you hit a win with your initial bet, write down your current balance (before the win is added to it). This will help you to do the proper math and you’ll be less likely to exceed the bet which would lead to losing the balance dedicated for the small initial bets. If possible, configure the slot to only one winline. The increased volatility plays in your favor. The following tables show the results of a million player simulation using the Reverse Martingale strategy. I made the simulations on a 96 % RTP medium variance slot with a $50 maximum bet per round. Each simulation was a session of 1000 rounds with basic bet + additional rounds, so players either lost the entire budget or won a satisfying amount. I was experimenting with various parameters for the initial bet (budget) and satisfying wins. The simulations above illustrate how effective this strategy is when playing with a smaller initial budget. They also illustrate how it becomes ineffective when initial bet gets closer to the slot’s maximum bet. Your chance to win 10x your budget is 4.4% with $100 budget and $0.10 basic bet. With $5000 budget and 5$ bet (same proportion) this chance drops to 1.22% and for $10 000/$10 drops even further to 0.124%. Out of one million high rollers who started with $10 000 and played with $10 initial bet, none of them managed to get over $500 000. The Reverse Martingale strategy works properly only if the maximum bet is at least 100x-200x higher than the basic bet. That’s true for the majority of casual players.True high rollers who desire high RTP and extreme wins should look for a different strategy. Note that for budgets and basic bets with which this strategy actually works, the average number of rounds played is around 1300. That’s 1.3x more than rounds played with initial bets. This explains the 1.3 coefficient in time of play formula above. The strategy which I call "Casual player" is one of the simplest strategies you can use. You start spinning with a certain bet size and keep spinning with same bet until you lose everything, win enough or decide to stop after certain amount of time. 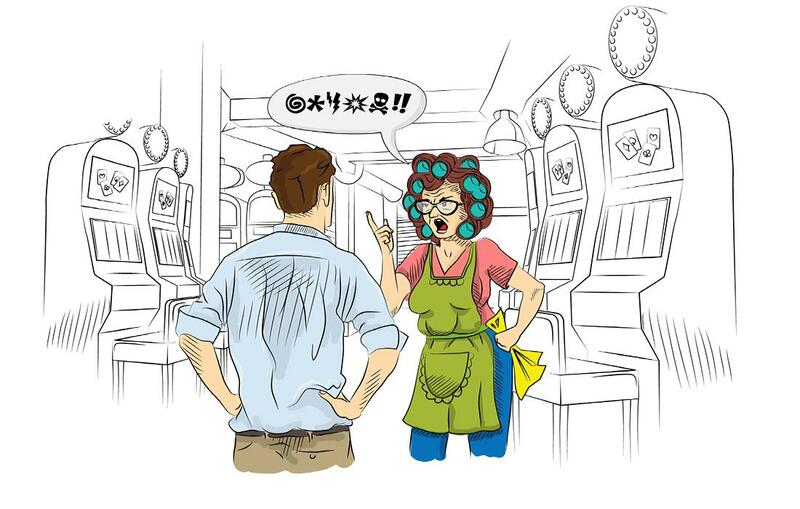 This strategy is used by many casino players. I have decided to analyze it mainly to illustrate how ineffective it is compared to my strategies. Let’s start by defining "The casual player". I know that many players change the bet size according to their intuition or increase the bet when they are on a lucky streak, but for the sake of simplicity, I’ll keep the bet the same during the entire simulation. For each setup I simulated one million players with the same 96% RTP medium variance slot. 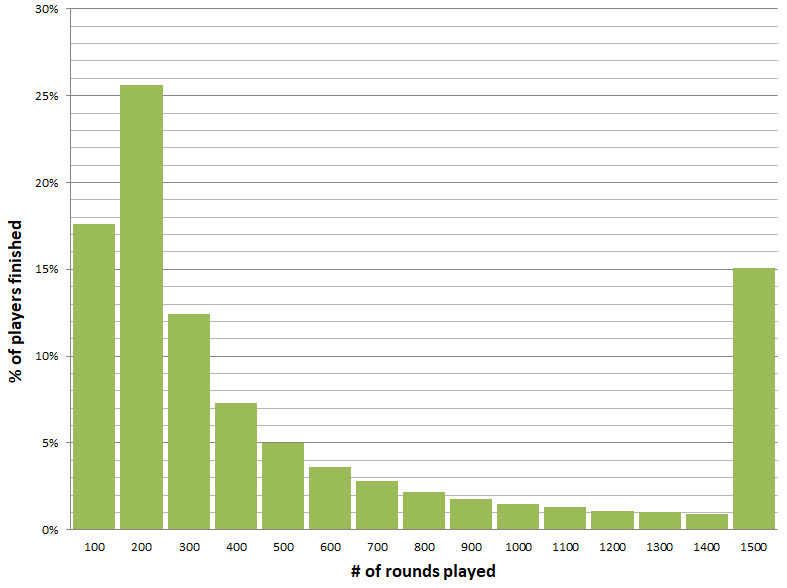 Normal gaming session may take 1-2 hours, so I have decided to fix (D) to 1500 rounds (number of rounds after which player leaves regardless of his current bankroll). Then I have experimented with a $100 budget. Note: Most slots work in a way that a win is always proportional to the bet. So the simulation using a $1 bet, $100 budget and $500 desired win will return the same results as the one with $10 bet, $1000 budget and $5000 desired win. Therefore, I made all the simulations with a $100 budget and I changed only the bet and the satisfying win. 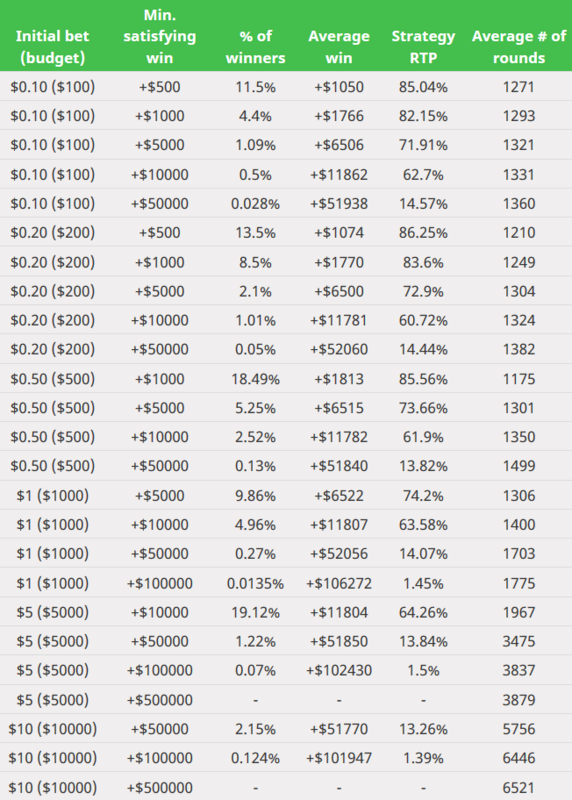 Here are the tables with simulations for $100 budget and max. 1500 rounds. There are 3 tables with satisfying wins of $200, $1000 and $5000 respectively. The problem is that at the same time you can have only two of those things. You can bet $10/spin, have nice RTP and aim for very high wins, but your gaming session will likely end within few minutes. You can bet $0.1/spin, kill time and not spend much money, but your chance to win more than just few dollars is minimal. Or you can bet $2/spin, aim for medium wins and play for half an hour in average, but you have to accept a low strategy RTP. The play time with constant bet strategy is unpredictable. 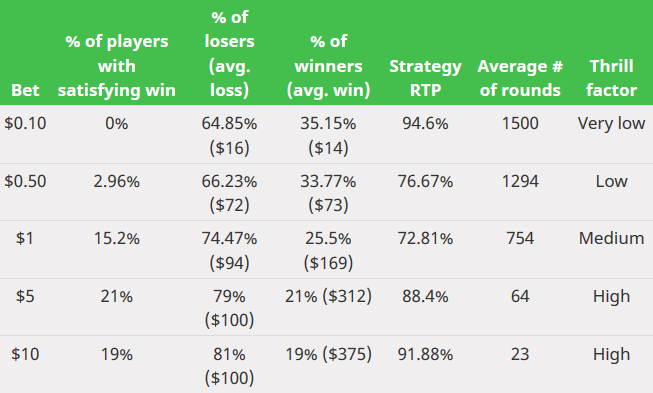 The average play time value might look good at first glance, but in reality it’s highly biased because of the lucky players who managed to play until the end. Following chart illustrates that for $2/spin and a $1000 satisfying win setup. You can clearly see that 55% of players ran out of their respective budgets within the first 300 rounds. The chance that you’ll lose your budget sooner than you intended is very high. This increases the risk of exceeding your budget, which is one of the signals of pathological gamblers. The analyzed setup with $2 bets is the one with the most balanced time of play. The setup with a bet of $5 per spin is even more unbalanced with 80% of players losing their budgets within the first 200 rounds. While unpredictable play time may be considered as clear negative, the unpredictable win size may increase the fun. 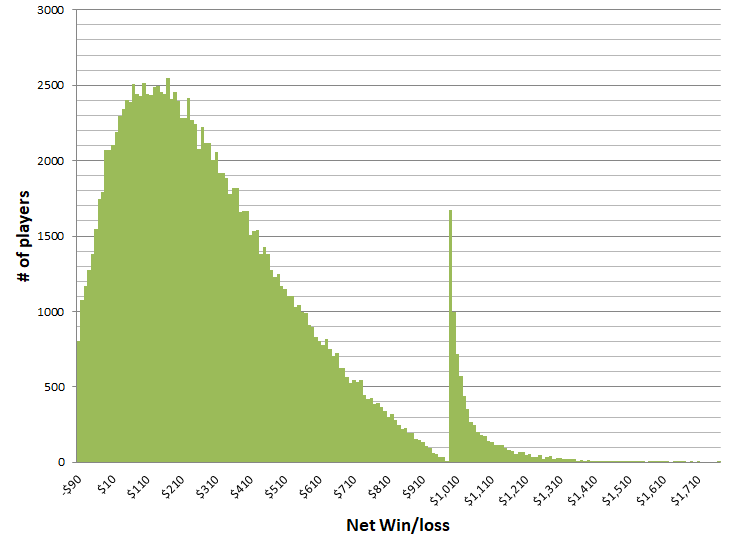 Following plot displays the distribution of net wins/losses in my million player simulation. I have intentionally omitted players who lost everything because there would be a huge spike at the beginning of the chart. The distribution reminds me of a "Gauss curve". The spike at $1000 value reminds how important is to know when to stop. 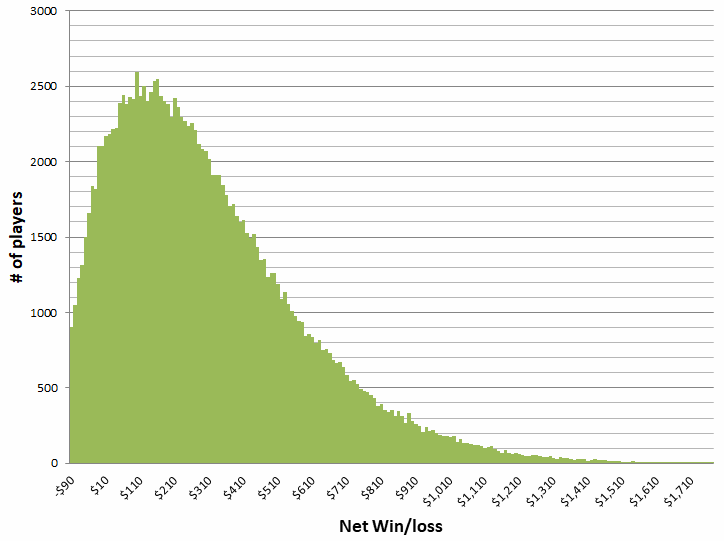 My next chart illustrates the distribution of wins/losses without the satisfying win rule. This chart resembles "Gauss curve" even more. The "know when to stop" spike is flattened. The constant bet strategy is the simplest betting strategy there is. You can achieve different results by choosing a different bet size, but you’ll never have good results like with the Smart Gambler strategy or the Reverse Martingale strategy. The biggest difference is in the time of play. With constant bet, the time of play is quite short and unpredictable. Also, if you aim for a giant win, choosing a different strategy is a must. You will almost certainly not get there with the Casual Player strategy. I can recommend Casual Player strategy only to those players who wish to kill time with low bets, low losses and even lower wins. In that case, I recommend placing one thousandth of your evening budget per spin. The optimal strategy of playing slots is surprisingly the simplest one. Don’t play them at all. I can call this "My mum’s strategy", because I knew that if I asked her which strategy she would use to play slots, she would tell me "I wouldn’t play slots at all". So I have asked her and she really gave me this answer. Mathematically, she is right. This is the only strategy with a 100% RTP. I made a computer simulation of million players who went to the casino and haven’t played slots. The simulation confirmed that none of the players lost anything so the theoretical RTP of this strategy is really 100%. The disadvantage of My mum’s strategy is absolutely no thrill factor as obviously you can’t win anything. Also, zero time of play may be problem in some brick and mortar casinos or gaming venues which require you to play once you are in. The solution for this might be to find some other excitement in your life. Money spared on gambling give you countless options ;).